Aram is a region mentioned in the Bible located in present-day central Syria, including where the city of Aleppo (a.k.a. Halab) now stands. At its height, Aram stretched from the Lebanon mountains eastward across the Euphrates, including parts of the Khabur River valley in northwestern Mesopotamia on the border of Assyria. The region was known as The Land of the Amurru during the Akkadian Empire (2335-2154 BC), Neo-Sumerian Empire (2112-2004 BC) and Old Assyrian Empire (2025-1750 BC) in reference to its largely Amorite inhabitants. During the Neo-Assyrian Empire (911-605 BC), Neo-Babylonian Empire (612-539 BC) and Achaemenid Empire (539-332 BC) Aram was known as Eber-Nari. The etymology is uncertain. One standard explanation is an original meaning of "highlands". This has been interpreted to be in contrast with Canaan, or "lowlands". Judeo-Christian tradition claims the name is derived from the biblical Aram, son of Shem, a grandson of Noah in the Bible. However, in terms of historicity, no ancient records from The Levant or Mesopotamia have ever been found that mention such a person, instead there are records of various Semitic peoples to the west of Mesopotamia such as the Ahlamu and the Canaanite speaking Amorites. The toponym A-ra-mu appears in an inscription at the East Semitic speaking kingdom Ebla listing geographical names, and the term Armi, which is the Eblaite term for nearby Aleppo, occurs frequently in the Ebla tablets (c. 2300 BC). One of the annals of Naram-Sin of Akkad (c. 2250 BC) mentions that he captured "Dubul, the ensi of A-ra-me" (Arame is seemingly a genitive form), in the course of a campaign against Simurrum in the northern mountains. Other early references to a place or people of "Aram" have appeared at the archives of Mari (c. 1900 BC) and at Ugarit (c. 1300 BC). There is little agreement concerning what, if any, relationship there was between these places, or proof that the Aramu were actually Aramaeans. The earliest undisputed mention of Aramaeans as a people is in the inscriptions of the Assyrian king, Tiglath Pileser I (1114–1076 BC) during the latter part of the Middle Assyrian Empire. 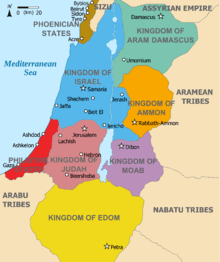 Several of the Aramaean territories located within Aram are also referenced in the Hebrew Bible. These include Aram-Naharaim, Paddan-Aram, Aram-Damascus, Aram-Rehob, and Aram-Zobah. However, Assyria fell into a temporary decline from the second half of the 11th century BC until the latter part of the 10th century BC, allowing the Arameans to establish a string of states across the Levant. During the period 1050 - 900 BC Arameans came to dominate most of what is now Syria but was then called Eber-Nari and Aramea. Two medium-sized Aramaean kingdoms, Aram-Damascus and Hamath, along with several smaller kingdoms and independent city-states, developed in the region during the early first millennium BCE. The most notable of these were; Bit Adini, Bit Bahiani, Bit Hadipe, Aram-Rehob, Aram Sobah, Bit-Zamani, Bit-Halupe and Aram-Ma'akah, as well as the Aramean tribal polities of the Gambulu, Litau and Puqudu. With the advent of the Neo Assyrian Empire (911-605 BC) however, the region once more fell fully under the control of Assyria. Large numbers of people living there were deported into Assyria, Babylonia and elsewhere. A few steles that name kings of this period have been found, such as the 8th-century Zakkur stele. The Assyrians and Babylonians themselves adopted a Mesopotamian form of Aramaic, known as Imperial Aramaic in the 8th century BC, when Tiglath-pileser III made it the lingua franca of his vast empire. The Neo Aramaic dialects still spoken by the indigenous Assyrians and Mandeans of northern Iraq, south east Turkey, north east Syria and north west Iran descend from this language. In 332 BC the region was conquered by the Greek ruler, Alexander the Great. Upon his death in 323 BC this area became part of the Greek Seleucid Empire, at which point Greek replaced the Assyrian introduced Imperial Aramaic as the official language of Empire, as were the names Eber-Nari and Aramea. This area and other parts of the former Assyrian Empire to the east (including Assyria itself) were renamed Syria (Seleucid Syria), a 9th-century BC Hurrian, Luwian and Greek corruption of Assyria (see Etymology of Syria and Name of Syria), which had for centuries until this point referred specifically to the land of Assyria and the Assyrians, which in modern terms actually covered the northern half of Iraq, north east Syria, south east Turkey and the north western fringes of Iran, and not the bulk of modern Syria and Lebanon and its largely Aramean and Phoenician inhabitants. It is from this period that the later Syria vs Assyria naming controversy arises, the Seleucids confusingly applied the name not only to the Mesopotamian land of Assyria itself, but also to the lands west of Euphrates which had never been part of Assyria itself, but merely Aramean, Phoenician, Neo-Hittite and Sutean inhabited colonies. When they lost control of Assyria itself to the Parthians, the name Syria survived but was dislocated from its original source, and was applied only to the land west of Euphrates that had once been part of the Assyrian empire, while Assyria-proper went back to being called Assyria (and also Athura/Assuristan). However, this situation led to both Assyrians and Arameans being dubbed Syrians and later Syriacs in Greco-Roman culture. This area, by now called Syria, was fought over by Seleucids and Parthians during the 2nd century BC, and later still by the Romans and Sassanid Persians. Palmyra, a powerful Aramean kingdom arose during this period, and for a time it dominated the area and successfully resisted Roman and Persian attempts at conquest. The region eventually came under the control of the Byzantine Empire. Christianity began to take hold from the 1st to 3rd centuries AD, and the Aramaic language gradually supplanted Canaanite in Phoenecia and Hebrew in Israel/Palestine. The Nabateans dominated the region between 100 BC and 100 AD, its most famous city being Petra. The Nabatean kingdom was eventually conquered by Rome. In the mid-7th century AD the region fell to the Arab Islamic conquest. The Aramaic language and Christianity survived among a sizable portion of the population of Syria, who resisted Arabization and Islamification. However, the native Western Aramaic of the Aramean Christian population of Syria is spoken today by only a few thousand people, the majority having now adopted the Arabic language. Mesopotamian Eastern Aramaic, which still contains a number of loan words from the Akkadian language, as well as structural similarities, still survives among the majority of ethnically distinct Assyrians, who are mainly based in northern Iraq, north east Syria, south east Turkey and north west Iran. ↑ Lipinski, 2000, p. 25-27. ↑ Palacios, Isaac Asimov ; maps by Rafael (1981). Asimov's guide to the Bible : the Old and New Testaments (Reprint [der Ausg.] in 2 vol. 1968 - 1969. ed.). New York: Wings Books. p. 54. ISBN 0-517-34582-X. ↑ ^ Assyria 1995: Proceedings of the 10th Anniversary Symposium of the Neo-Assyrian Text Corpus Project / Helsinki, September 7–11, 1995. ↑ "The Terms "Assyria" and "Syria" Again" (PDF). Archived (PDF) from the original on 13 June 2011. Retrieved 19 June 2011.